The Mailtraq Mailing-list server is provided as part of your Mailtraq license and is a perfect and cost-effective solution for a variety of tasks, from email marketing to group collaboration and announcements to message distribution. Mailing-lists enable you to send messages to multiple recipients by sending one message to the Mailing List and have the Mailing-list Server manage the replication of that message. Mailtraq has a very flexible mailing-list server that makes it suitable for sending messages to small local groups or to very large lists for email campaigns. See mailing-list server video. There are four main types of Mailing-list, in addition to the Basic Mailing-list which can be configured for any purpose. The Mailing-list Server has a Wizard to help you configure your mailing-list in the manner you wish with just a few simple questions, and there is extensive configuration assistance available for fine tuning and custom management. 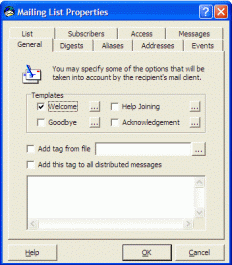 The Mailtraq mailing-list server has a number of advanced features to manage large mailing lists, including Automatic Address Check where if a message is returned, the invalid subscriber can be automatically removed or suspended, Delivery Receipt Requests are stripped, and the mailing-list server also incorporates VERP (Variable Envelope Return Path) - 'Bounce' processing designed to cope with bounces where the original subscriber address isn't included.